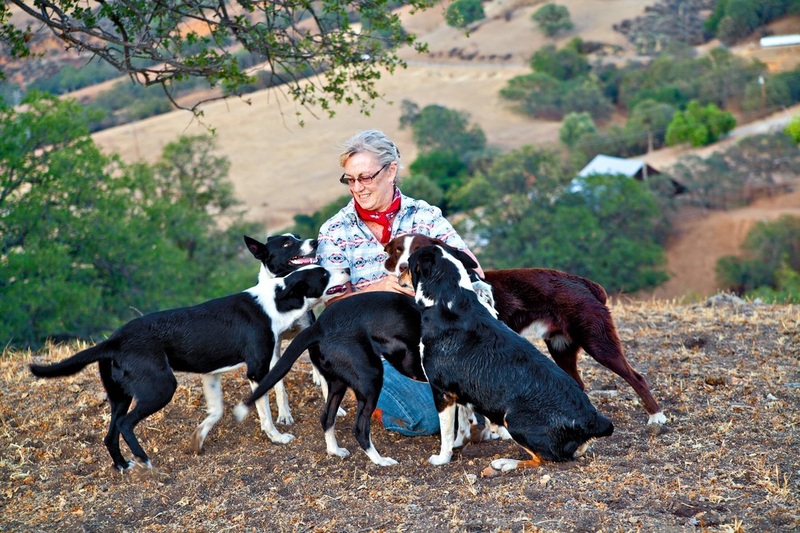 Garcin McNab Collies - Mcnab collie breeder in California. Also known as Mcnab Shepherds. Mcnab dogs and puppies for sale. Welcome to Hidden Highlands Ranch! ﻿Howdy! and welcome to Hidden Highlands Ranch! Home of Garcin Stock dogs and Justy Garcin Cattle co.,we would not be able to gather our cattle with out the help of our canine working partners! 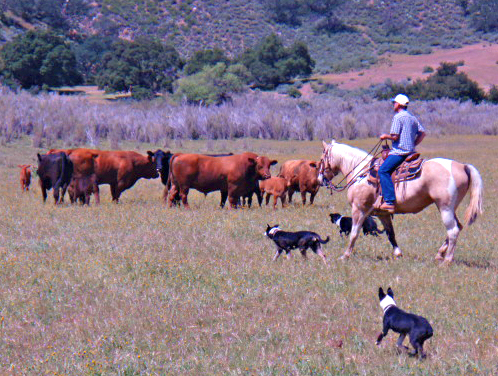 Our ranch dogs are bred to withstand the rugged chaparral country of central coast California! They are known for their loose eyed heading, fetching style, mustering cattle and all types of livestock. One of our Garcin Stock-dogs is worth three cowboys! Herding dogs are extremely intelligent, loyal, obedient and athletic. Besides herding work our dogs also excel in many different venues: such as Agility,Obstacle competitions, Obedience trials, Nose work, Search and Rescue, Disaster Relief searches, Forensic service work, Truffle hunting and other plant species indicators nose work. Our canine clan are also proving to be excellent Service and Therapy dogs. These all around ranch dogs are loyal, protective family companions.They protect and get along with all the inhabitants on the Ranch/Farm. Our mission has been to restore and preserve well balanced stock dogs that will be genetically healthy for generations to come! We have taken the DNA on all of our current working/breeding dogs for breed types and for over 170 congenital genetic diseases and we are proud to say that our dogs are genetically sound. Announcing the birth of Pixie & Elkos offspring arrived April 19th, 4 healthy males & 4 healthy females! To view updated photos of the current litter, click on the below button. Our purebred McNab shepherds are registered with the McNab shepherd registry. The only registry that has traced lineage back to the original McNab Ranch and produced a signature line for the breed after 8 years of collecting DNA samples through Mars Wisdom 4.o panel kits,we discovered many of the dogs in our breeding program qualified as pure bred McNabs. We are also required to take the DDC DNA for parent verification for each litter born.No other registry's ask for verification of the DNA except the McNab shepherd registry.Our point being this is an honest registry that we support and trust with our lineage.There for if you are looking for a purebred McNab Shepherd, you have come to the right place! We have high standards for our "Herding Heritage stock dog" breeding program which consists of Purebred McNab Shepherd lineage from established respected bloodlines, as well as the Mendocino area land-race heritage breeding : Sage Horn lines, the Covelo shepherds, Ranch bred border collie lines, and an infusion of a very old line of Australian kelpies. All of our dogs have been DNA'd tested for over 170 known congenital diseases and we are proud to announce the dogs in our current breeding program are genetically free of congenital diseases.Please go to ​Our Dogs tab and click on the Canine Clan , you will find our Garcin bred stock dogs and their bios there. Thank you for visiting and please come back again!